Are you a student with First Nations, Métis, or Inuit heritage? Are you interested in an art / writing contest with cash prizes? 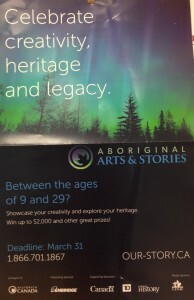 If so, check out the 2015-2016 Aboriginal Arts & Stories Contest! The theme of the contest is A moment of theme in Aboriginal history of culture. Check out the poster or the website www.our-story.ca for more information. Mr. Wilson can help guide you through the application process, too. Good luck!